I recently started exploring my city on foot as part of my program of exercise. Walking a town gives one a much better appreciation of the details of a community. Here I will document some of my walks. 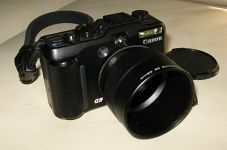 I'll also comment on the performance of the Canon G9 camera and document the pictures with photographic details. 2010 April 30: Today I'm initiating a new 2010 Photo Walks home page starting a new walking season with a Canon G11 camera. Sometimes exercise can come in small batches. I now make it a practice to park some distance away from the entrance to the grocery store so each trip allows me a certain amount of exercise (I use to drive around endlessly waiting for a close-by parking spot to open up to minimize my walking in the parking lot). Today I was watching a TV program on the Food channel on pizza. They showed a very interesting looking sloppy joe pizza. I determined to fix such a pizza soon. When I measured my BG level (as a diabetic I measure my blood glucose number on a regular basis) after lunch and found it to be 143 (higher than I like, even after a meal) I decided to go for a walk, as exercise tends to lower my BG number. I immediately decided to walk to the grocery store to get the items I needed to make that sloppy joe pizza. I don't usually walk to the store, but this was an ideal opportunity to combine exercise with grocery shopping. On the way home I also had a chance to try out a new wide angle attachment for the Canon G9. Go to: Walk of 28 August 2009. Today my grandson was staying with us while his family participated in Tae Kwondo activities. We decided to have sandwiches from a local Mason deli called The Vault. I set out on a walk, designed to be at least 45 minutes. This would get me over an estimated 300 calories used on the walk, which is my minimum to count towards a day's exercise. I mark off the days I exercise on a calendar to keep track of my progress. So, I dropped by The Vault to order some sliced cheese, set out to walk by the Mason Martial Arts Center to look in on my daughter's family (Meg, Jeff and granddaughter Hazel), and then pick up sandwiches at The Vault. I extended the beginning of my walk to insure reaching my minimum walking time and discovered a small car show at the local A&W Restaurant. The sandwiches turned out great. Go to: Walk of 26 August 2009. After making a trip to the bank to deposit my chess tournament winnings I decided to walk a little further, which turned into an unexpectedly long walk of almost an hour and a half. Wrong shoes, wrong socks, but I had my camera and water bottle so it worked out in the end. It's always fun to discover a new area in Mason. 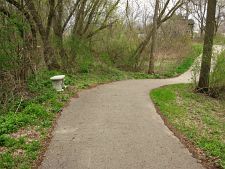 This time I discovered that the Hayhoe Riverwalk ran along side the Maple Grove Cemetery and continued north for some distance. Pictured to the right is one of the bridges the path took crossing the ever-present river. Go to: Walk of 24 August 2009. Sometimes I head off in a random direction. For this walk I had a definite destination, to cross the Highway 127 overpass on Columbia Road to check out the other side. Some overpasses in Mason provide no walking room, so I don't cross them based on safety considerations. Here there was a narrow sidewalk reached by walking on a generous shoulder, so there was no problem. Too bad I dropped my recently purchased polarizing filter. Perhaps I'll head back there soon to look for it ... I doubt it is very heavily traveled on foot. Go to: Walk of 21 August 2009. Though I've lived in Mason for 16 or so years I've never gone to this one-day event at the local airport. Of course, I've never seen a lot of places in Mason before I started taking these exercise photo walks. I can often hear the planes arriving or leaving the airport, which is only a couple miles from my house. Now that I've walked to the airport a few times (see Walk of 23 June 2009) I was determined to go this year, and it was certainly a fun and worthwhile event. When an airshow is going on in a small town it is impossible not to be aware of it, so this year we checked it out and had a great time. For a small town Mason seems to have a lot going on. Go to: Mason Aviation Day 15 August 2009. After my short trip to Indianapolis, Indiana to attend the United States Open Chess Championship I felt the need for some exercise. I went to the gym the last two nights and worked hard on the treadmill, but decided to follow up with a walk of at least 50 minutes tonight. Alas, my weight is up four pounds from my recent low, when I edged below the 200 pound mark for the first time in many years. 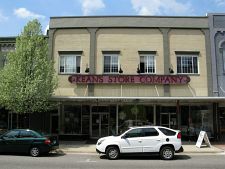 I headed off down town to take care of a little business, then I followed a familiar path near the antique district of Mason. I took a few photos of the Maple Grove Cemetery, including one shot of the sky to try out my new CPL (circular polarizer) filter. Then I walked past the Americhem Sales office and took a few shots. I walked past the Mason Tai Kwando studio, where I greeting one of the owners Mrs. Daff, and then continued west on North Street, where I encoutered the Ingham County Road Commission. A truck drove up as I was getting ready to take a photo and the gate opened, allowing me a good view inside the compound without a fence in the way. It was then west on Columbia to the Keith Hayes Park and then back towards home. I took a couple shots that caught my attention and arrived home via the steep uphill walk on Elm Street next to the Jefferson Square retirement home. Estimated calories expended: 450. Go to: Walk of 11 August 2009. Today I added two new pages that are a bit different. These reflect walking in Mason, but not my regular walks meant for exercise. Rather, they are interesting in themselves and reflect local life. This page shows some of the local fair. The Ingham Country Fair is held in Mason every summer and is located in easy walking distance from my home. I often go through or nearby the fairgrounds on my exercise walks, frequently late at night (and therefore not documented here since I seldom take photos on my night walks). I set up a new set of links near the top of this page labeled "Index of other Mason events". The second page added is of the 4th of July parade. I had a special reason for visiting the County Fair today, to see how my fudge fared in competition. Alas, I only took the 2nd place ribbon. However, I stuck around a while checking out the animals, midway and music. 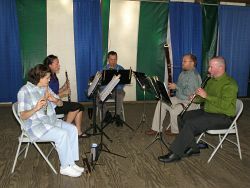 I got lucky when I heard the music and discovered the Capital Wind Quintet playing. Go to: Walk of 3 August 2009. Tonight I set out with limited goals: (1) get at least one hour of walking for exercise, (2) return to the Ingham County Animal Shelter and take a self-portrait in the dog-cutout, (3) walk to the SNAP gym where I exercise a few times a week and (4) get some triple-chocolate ice cream on the way home. I achieved the first two. I used the modopocket tripod (described in my Walk of 27 June 2009 below) to take the self-portraits, sitting the camera on the driveway in front of the dog-cutout. I first discovered this cool dog cutout on my Walk of 15 July 2009. It was a challenge rushing from the camera to position my head in the cutout within the default self-timer setting of 10 seconds. The Canon G9 does allow you to set a different delay in the menu system. The final path to the SNAP gym required crossing a highway on a narrow bridge with no safety margin for walkers, so I abandoned that idea in the name of safety. I returned home close to 10pm so the ice cream store was closed, maybe for the best. Go to: Walk of 28 July 2009. Following an unusually good meal (where I pigged out completely) I felt the need for some real exercise, so I set out for a long walk and it turned into an even longer walk than I intended. 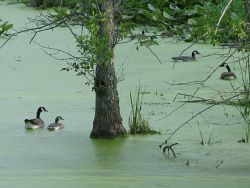 I usually don't take a lot of care not to go "too far" before turning back, and in this case I got to a point where I was in reach of the pond covered with green pollen that had been so interesting on my Walk of 4 July 2009. So I just kept going and walked for over two hours. I had set a personal best of 202.6 pounds this morning (it has been many years since I've been under 200) and the next day I bounced up to 203.4, so maybe the walk avoided an even bigger gain. Though for much of the walk I was in familiar territory, I did manage a few new discoveries, such as the county jail, animal shelter and the drain commissioner's office, along with other less significant things. Go to: Walk of 15 July 2009. A short walk, but every walk has value. In this case I was taking my van to Andrew's Chevrolet on Cedar Street for an oil change. I stopped along the way to photograph the cherry tree in front of the Mason Public Library. I've picked cherries several times recently planning to enter "Mason Library Cherry Fudge" in the annual food competition at the Ingham County Fair. After dropping off the van at Andrew's I walked north on Cedar Street for a short 35-minute walk. 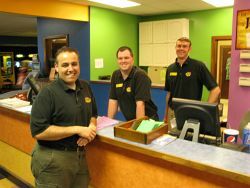 I ended at the local bowling alley where I met some friendly gentlemen who ran the place. It's always good to take advantage of situations to get some exercise. In this case I walked for 25 minutes instead of reading a magazine in the waiting room of the service station. Sounds good to me! Go to: Walk of 9 July 2009. I have a rather long walk today, heading to the north of town. After walking through the town square and viewing a small car show I headed north on Hagadorn Road, turned left on Howell Road, then left of Kerns Road and then south on Cedar Street and finally back home. 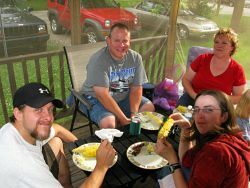 I went by my daughter's family's house just as they and their friends were finishing up their special 4th of July cookout. Later there was a parade and the annual Mason firework display. Go to: Walk of 4 July 2009. I just obtained a Manfrotto 797 modopocket miniature "tripod" I got so I could take photos including myself during my walks. I'll establish an Equipment page soon with photos of my gear (I hope to add a small flash soon and maybe a close-up lens and wide angle lens). For now I'll just show a few self portraits made with this new modopocket device. See Light Description for more information on the modopocket tripod (as well as a lot more information on the Canon G9) or check out the Monfrotto web site. I headed out for some exercise and to take a few self-portraits using the modopocket. Since setting up for self-portraits is a bit time-consuming I carefully stopped my timer so I would know how many minutes I was actually doing my brisk walk. Go to: Walk of 27 June 2009. 80+ minute brisk walk to the Mason Airport. 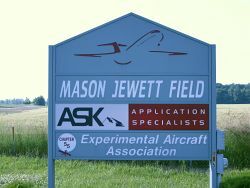 After bypassing the Mason airport on my last walk I dedicated this walk to visiting the air field. It took about 20 minutes to reach the entrance to the field. 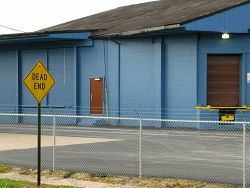 The sign at the right greets visitors at the entrance on the aptly named Aviation Drive just off Eden Road. I met four gentlemen working on an experimental craft at the airport. I took photos of most of the features of the airport I found of interest. Being early evening when I arrived I didn't see much activity at Jewett Field, but I was able to see a number of airplanes, including an interesting old craft through the window of one of the hanger buildings. It was a bright sunny day, which made for hot walking. Go to: Walk of 23 June 2009. For Father's Day I went on a 2+ hour walk, probably somewhat over 100 minutes of actual walking. I've been walking in the evening or late at night, so I haven't carried my camera. I'm planning to add a flash so I can take some night photos, but that will come later. Instead of my usual late afternoon/evening walks I left about 2pm. It was a partly cloudy day and a bit warm. 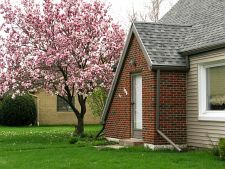 I turned on our house air conditioning for the first time yesterday ... we've had a very pleasant Spring in Mason, not too hot, but it is warming up now. I've been wanting to check out the area south of Mason, so today I walked south on Barnes Street past Kipp Road (where Barnes changes name to Eden Road). There are several businesses out there that I documented today. I walked past the air port, but given the length of my walk I decided to leave closer inspection of the air port to another day. Go to: Walk of 21 June 2009. After registering a blood sugar reading of 154 I determined to get some exercise to get it back to a good level. I hadn't intended to stay out for two hours (around 110 minutes walking time) but had a great time exploring new territory. At one time walking more than 15 minutes seemed boring to me, but now I find longer walks very interesting. I guess it is a matter of getting accustomed to something. My destination was the blue buildings picture to the right. The color and roof lines have attracted my attention numerous times as I drove through the area. I decided to walk down the road (North Mason Street) past this building to explore a new area. I failed to note this was a dead end and after walking about an hour entered a real adventure, trying to find my way back to known territory by striking out across country and through storage lots. I got some shots of my daughter's family along the way and some other interesting features of Mason, including one of the many squirrels making their homes here. My duck and rabbit photos weren't worthy of reproduction here. As before, the original images were 4000x3000 pixels. The "large size" images have been resized to 1000x750 and the thumbnails below are mostly 250x188 pixels. Any cropped image will be identified as such. Go to: Walk of 29 May 2009. 65 minute brisk walk. After dinner my blood sugar was high and I also needed some cash from the bank, so even though it was getting a bit dark (it rained later) I decided to set off on a photo walk. As long as I was heading out I decided to investigate an unfamiliar part of town, further west on Ash Street (well past the Ace Hardware store at Ash and Cedar Streets). 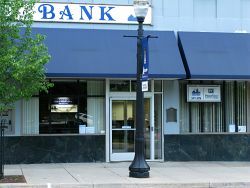 Pictured to the right is the entrance to Mason State Bank, where I could access an ATM machine. My walk eventually took me to Keith L. Hayes park, previously unknown to me. One great thing about these walks is the discovery of new areas of Mason. I also had a great walk along the railroad tracks running through Mason, the site of many nice wildflowers. At one time I didn't like the idea of lengthy walks, thinking anything over 15 minutes was excessive. Now I find I really enjoy the longer walks and look forward to seeing new areas of my town. 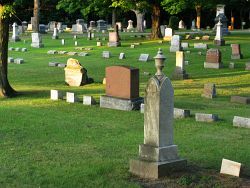 Many of the photos taken in the low light levels demonstrate the effectiveness of the Canon G9's IS (Image Stabilization function). An amusing instance occurred on the way home. I heard a loud noise. I turned around just in time to see a large farm vehicle approaching on the street. That's something interesting about living in a farming community ... you get lots of chances to see farm equipment, sometime coming right down the street (or driving very slowly right in front of you on the street). Go to: Walk of 26 May 2009. Feeling the need to work off some calories I set off on a walk that lasted 96 minutes. Generally I walk fairly briskly with numerous stops to observe my surroundings and/or take photos. I tried to simulate my normal walking pace at the gym and found I was burning about 8 calories per minute while walking at this pace. Assuming I was actually walking for 60 minutes of my walk then I burned about 480 calories. Not bad, and I saw a bit more of my town. I headed out south similar to my Walk of 25 April 2009. However, I was walking south on Jefferson Street. When I reached a large lot of grass (meant for some future commercial development) and strolled out into the field to see what it was like. As I walked south it became more marsh-like. To avoid wading through mud I headed back towards Jefferson but reaching the edge of the field saw that the railroad tracks were between me and the street. 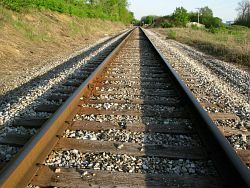 I walked the rails for about four blocks (frequently looking over my shoulder) till I reached Kipp Road. I headed west on Kipp, past Jefferson Street till I reached Cedar Street. This was a most interesting route taking me to the other side of Sycamore Creek, which means I am committed to a lengthy walk since there are few paths over the creek back to my side of town. I ended with a steep walk up Elm Street, which is one block north of my home street Cherry Street. Go to: Walk of 12 May 2009. After two days of bad weight (I've gone up) I took a 52-minute walk and watched my diet. Hopefully tomorrow will be better. I've been promising myself a reward when I reached 210 pounds, a 52-pound loss. I just purchased a 70mm refractor telescore, something I've wanted for a long time both for astronomy and for photography. This will give me a 430mm F6.1 lens for my Nikon D200 digital SLR. I may also try adapting it for the Canon G9. I've promised myself another reward when I reach my final goal of 190 pounds ... just 20 pounds to go! Go to: Walk of 8 May 2009. I was working on repairing the fence around my back yard garden when I realized I needed some additional supplies. I started to get in my car to drive to the local Ace hardware store when I realized this was a perfect excuse to go on a photo walk! It took me about 25 minutes to walk there and my round trip took 52 minutes, not including shopping time in the store. It is usually a good idea to take opportunities to walk a little further. For instance, when shopping at the grocery store, park at some distance from the store to get in some extra walking. I kept the photos simple this time ... I tried to frame each photo precisely to avoid doing any cropping, which also simplifies my HTML work creating the web page. I also kept the desciptions simple. I did take a few photos of landmarks in Mason. Go to: Walk of 5 May 2009. Today's walk served two purposes in addition to exercise. I returned to the Ingham County Fair office to pick up booklets with contest information (I'll be entering my "Franklin's Fabulous Fudge" this year). I also arrived at my granddaughter Hazel's school in time to walk her home to my house to spend a little time with me and spoil her with treats. 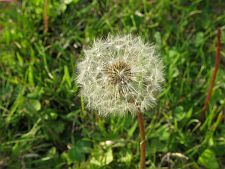 I also took a number of photos to demonstrate the high quality possible with the highest JPG setting. Later I'll try out the RAW capability. All the photos have a link below them for displaying a full resolution 4000x3000 pixel photo with no processing of any sort (except for the in-camera JPG conversion). 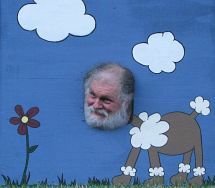 Check out the amazing shot of the Ingham County Fair Executive Director Thomas A. Edman. I only realized later that this photo (with an equivalent 60mm lens setting) was taken at 1/6th second! 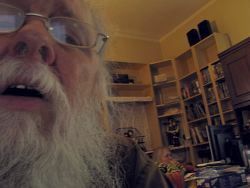 This was an excellent test of the very effective IS (Image Stablilizing) function of the Canon G9. 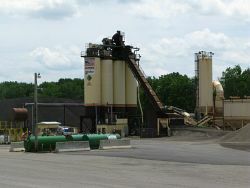 Check out the full resolution image to confirm the excellent dtail shown in this photo. See photo #9. Go to: Walk of 4 May 2009. 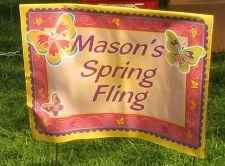 Today was the annual "Spring Fling" in Mason, where vendors surround the historic court house building in the town square selling mostly crafts, such as hand made jewelry and baked goods. 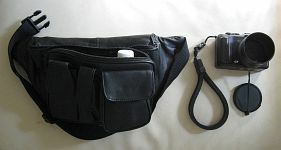 I found the fanny pack pictured at the top of this page, ideal for carrying my camera and a small water bottle on my walks around town. Go to: Walk of 2 May 2009. Walked past historic court house where "Spring Fling" was underway, north on Jefferson to Skate Board Park, south on Rayner Street to Laylin Park, west on Maple Street and back home (85 minute walk). For my second photo walk I headed to Rayner Park and the Ingham County Fair office to pick up information about this summer's fair competitions. I am particularly interested in entering the fudge contest this year. The park is next to the fair office and has an attractive lake with flowing water under the bridge. 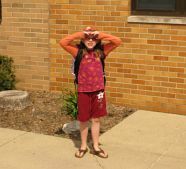 I passed by my granddaughter's school Steele Street Elementary School, where she attends first grade. The signs of Spring are all around with green grass, flowers and flowering trees. I took this opportunity to test out the use of ISO400 with the Canon G9. Go to: Walk of 28 April 2009. Walk from Cherry Street past Steele Elementary School to Ash Street east to Raynor Park and the Ingham County Fairgrounds. As a diabetic (67 years old) I have discovered the health benefits of exercise. Part of my new exercise program is taking brisk walks, which helps lower blood sugar levels and burn off calories to aid in weight loss. 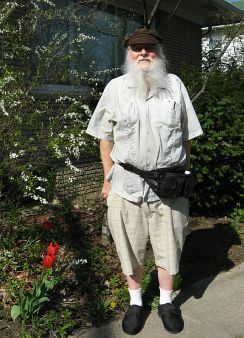 I have also discovered that I live in a beautiful community with many delights discovered only by exploring on foot. This was my first walk with a camera in hand. Go to: Walk of 25 April 2009. South on Barnes Street past Mason High School, West towards Jefferson Street, North on River Walk.